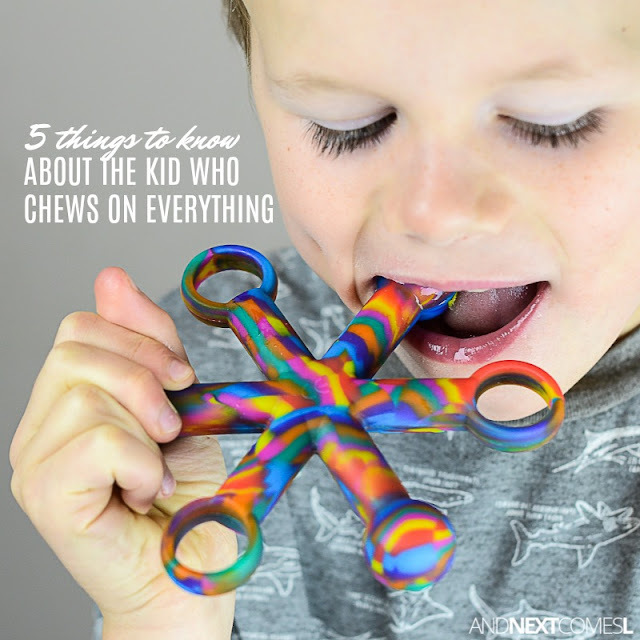 Do you have a child that chews on everything? 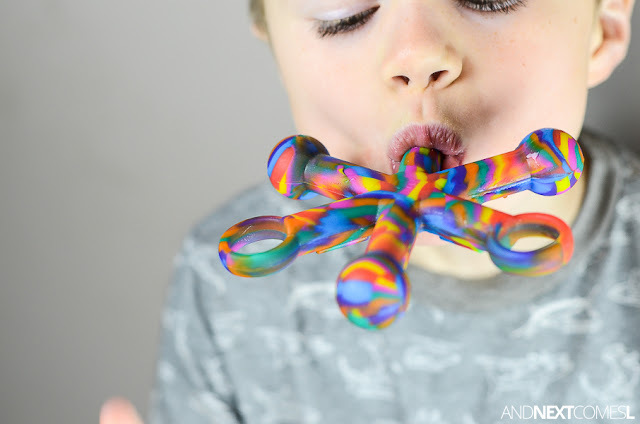 Here are the reasons why your kid needs to chew. I often find myself repeating the phrase, "Don't chew on that. Find a chewy instead." That's because, even at age 8, J still chews on everything. His coats, sweaters, and the zippers on them end up taking the most abuse. And it really would be nice to have those coats and sweaters last long enough for K to wear them in a couple of years...A girl can dream, right? Ugh and then there's winter...he chews on the collar of his jacket. It gets wet. It rubs his cheeks while he plays outside in minus -20C or colder temperatures. His face gets chapped. It's awful! And our winters are long and cold! See, J is an aggressive chewer and has chewed through more chew necklaces than I care to admit. So we're always on the lookout for other durable options for him. 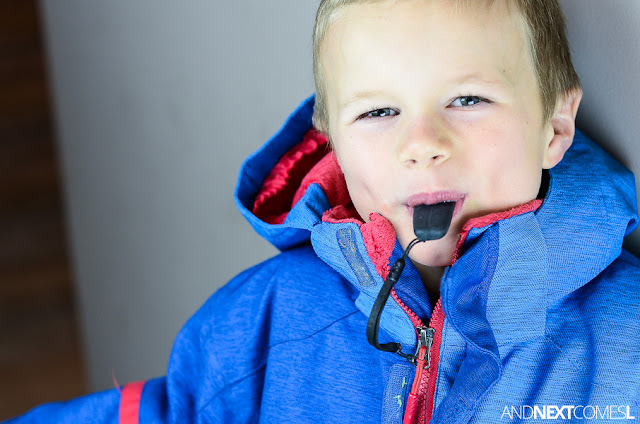 Options that will save his teeth (and his coats and his cheeks!) from damage. But there's a reason he chews on everything and I want you know those reasons why. Perhaps you have a child that chews on absolutely everything too and you are struggling to understand why yourself. Well, here are 5 things I want you know to know about the kid who chews on everything. This post is sponsored by Chewigem Canada. That means they sent me some amazing goodies to put to the ultimate chew test by my son J. I only ever accept paid work from companies and products that we would truly benefit from and love! See my honest reviews below. All opinions are my own. Incorporating a variety of textures in your child's mealtimes and snacktimes can drastically reduce the need to chew on non-food items. For instance, foods with chewy textures like beef jerky, dried berries, fruit leather, or bagels provide lots of deep pressure and resistance to the jaw. Crunchy foods like nuts, pretzels, or carrots can also work wonders too! You can see more ideas here. I always try to include chewy and crunchy foods into every meal and snack to help J get the sensory input he needs, which brings me to point two. 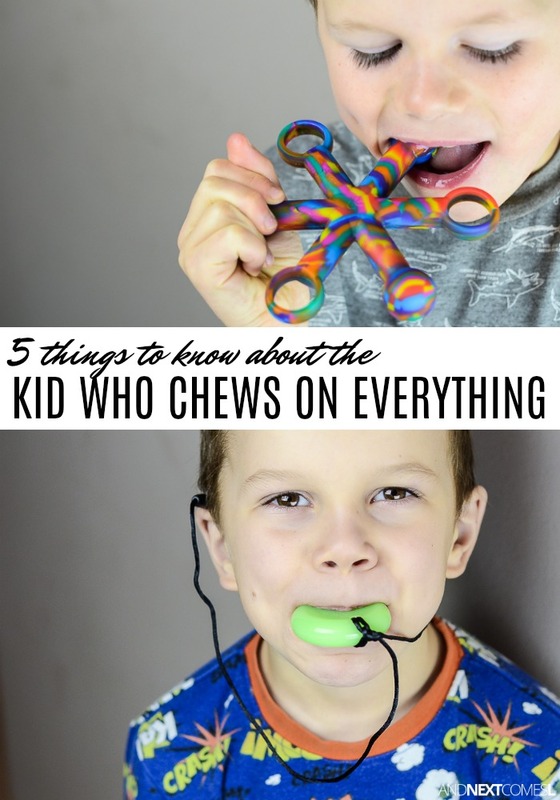 Kids who chew on everything do it because they need oral motor sensory input. They crave the deep pressure that chewing provides to their gums. They basically use chewing as a way to cope and self-regulate. It can help them stay focused too! The deep pressure that chewing provides to the gums also provides proprioceptive input, which calms children's bodies and helps them self-regulate. By offering more heavy work style activities around the house or in the classroom, you can also help cut down on the frequency of the chewing. Need some heavy work ideas? Try this list of 50 heavy work activities for kids. With J, we know he chews more when he is anxious about something or when he needs help focusing on a task. 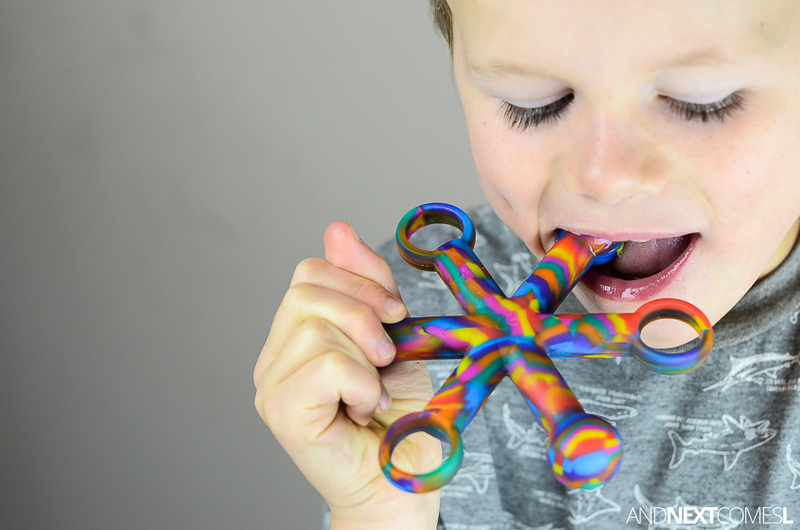 For him, an increase in chewing is related to his stress and anxiety levels, which can actually be the case for many kids. So take the time to dig deep and figure out why your child may be chewing and see if you can discover any patterns. 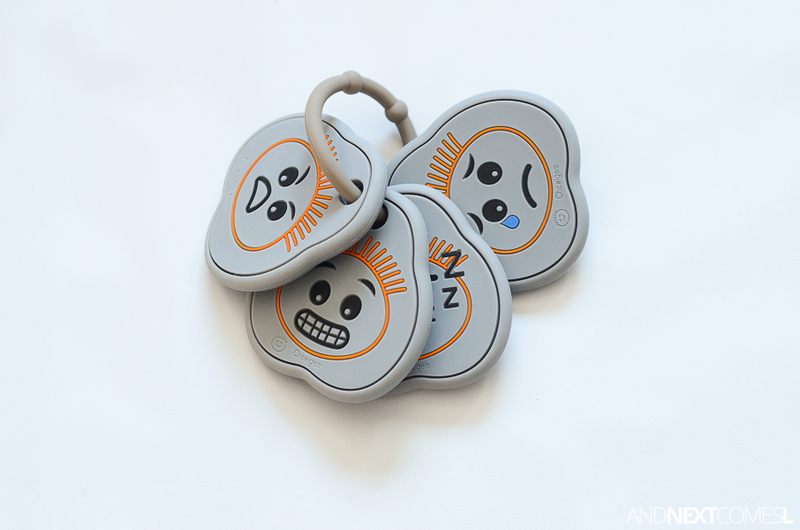 One really cool new product from Chewigem are these Chewimojis. They're so new that they weren't even on the website yet when I received them. They include four double-sided chewies with facial expressions to encourage kids to think about their emotions while they chew. The kids thought these were really awesome! The chews themselves are thick and durable so they'll easily withstand heavy, aggressive chewing from the likes of kids like J. I do find the overall size a bit bulky, but I think they would make a wonderful addition to a calm down box at home or in the classroom. Finally, and perhaps the most imporant, these kids need safe options to chew on. I know I have caught J chewing a lot of unexpected items like LEGO bricks or puzzle pieces. He'll basically chew on whatever is close by and handy. For this reason, we like to leave chewies accessible in nearly every room in our house, as well as on his coats and sweaters. Chewigem has lots of wonderful options to "chews" from - see what I did there? - but I'm going to show you our favorites! 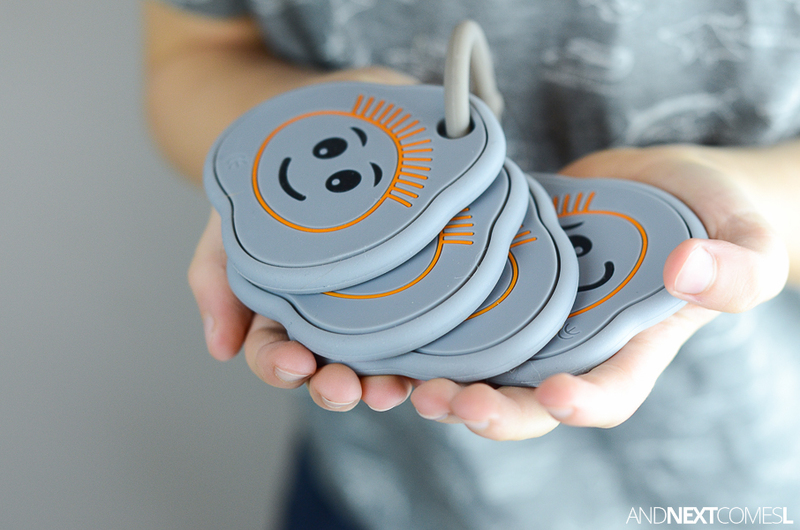 However, I think I was most excited for Chewigem's zipper pull "Toggle Boards." I had to make sure Chewigem gave us one to try out. We've got to save those coats and sweaters after all! Besides, J's need to chew on his coats is unmanageable most days. 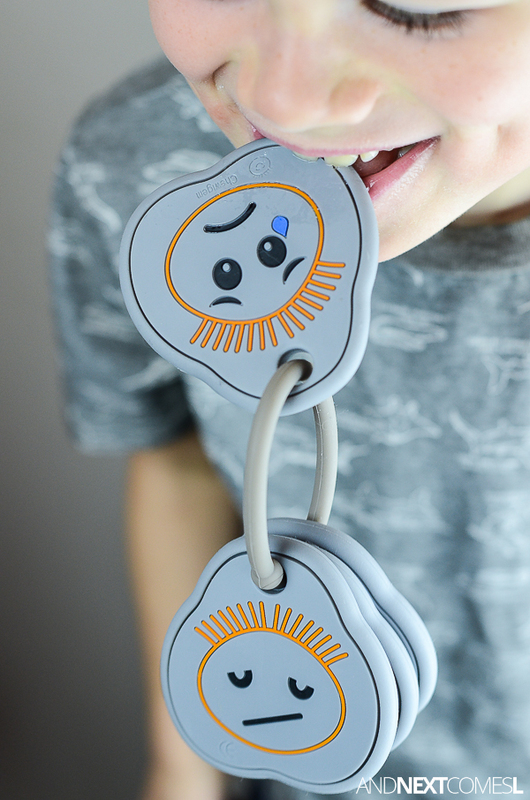 So having the chewable zipper pull handy is really beneficial to him (and to my sanity)! Of course, there is also a huge selection of chewable necklaces and bangle bracelets to try. I really like the thickness of the disc chews (pictured on the left) while K really liked the flexibility of the realm ring necklaces. He particularly loves cramming it entirely into his mouth! As a bonus, he discovered it fits perfectly inside the tread bangles (not pictured) to make a "real tire" as he calls it. Another fun surprise is that the disc chew Chewigem sent us glows in the dark. That means I can toss it in my gigantic purse and still have hopes of finding it! We have fallen in love with some many of the chews from Chewigem! The rainbox hexichew has been the absolute favorite of the bunch and has lasted MONTHS, which is huge for us. You can check out Chewigem at the link below. Save 10% on all regular priced items (except Discovery Boxes and paid memberships) with the coupon code: ancl10 (ancl = And Next Comes L so yeah that's an L not an I in that coupon code). Oh and if you notice the string in the picture below is caught on K's ear, it's on purpose. He wanted it like that for his photoshoot! What a character! Such a great post with so much information. 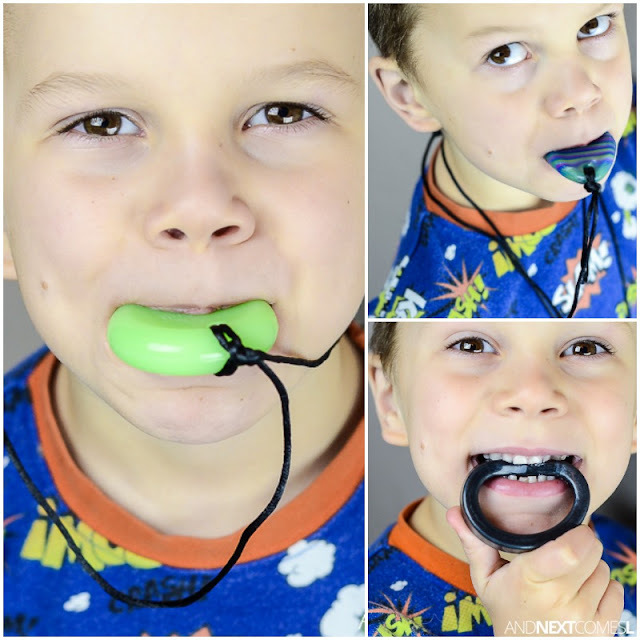 My littlest chews a lot when he is nervous or anxious. I love the zipper pull ideal as he always ends up chewing the edge of his coat. Yes, the zipper pull has been a LIFESAVER for us!! This is fantastic! My sister in law and I were just discussing our two kids that chew on everything today. Really thrilled to find out about Chewigem - thanks, Dyan. Glad you found it helpful, Katie! You do a great job of explaining why some kids need to chew. This can be a really misunderstood topic, but you shed light on it in a really helpful way. Does the need to chew continue into adulthood? Honestly, to date, nothing is more satisfying than chewing on Lego. Unless perhaps Barbie shoes. When I was little I chewed because I liked to chew. It was fun, felt good, and I could chew in a rhythm. After taking piano lessons, I stopped chewing. The rhythm, putting my active mind into music, solved it. And, though I do not chew today, and don't even play the piano any more, I have fond memories of chewing Lego. It really was just the best chew. I love your comment. I have a son that chews on hard plastic and metal. He also likes to rip fabric with his teeth. I haven't found a chew that he loves- he'd rather bite his toys. 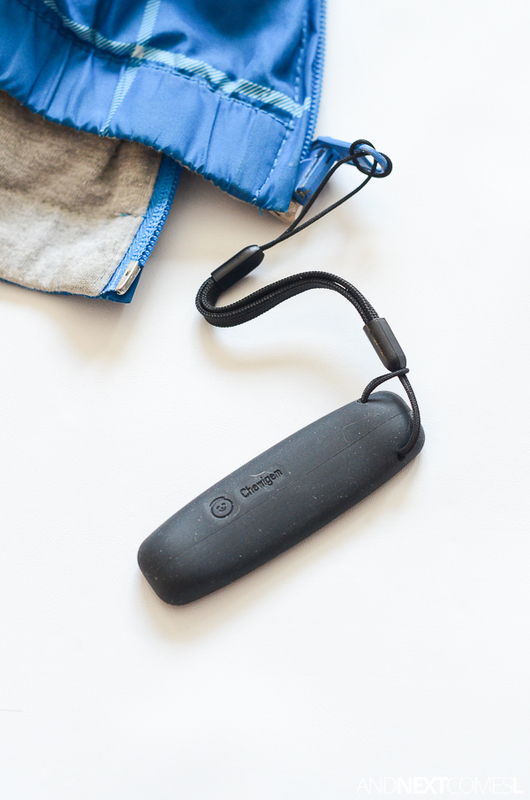 The toggle chew looks brilliant.